'It is some years now since I realized how many false opinions I had accepted as true from childhood onwards...I saw that at some stage in my life the whole structure would have to be utterly demolished'In Descartes's Meditations, one of the key texts of Western philosophy, the thinker rejects all his former beliefs in the quest for new certainties. Discovering his own existence as a thinking entity in the very exercise of doubt, he goes on to prove the existence of God, who guarantees his clearand distinct ideas as a means of access to the truth. He develops new conceptions of body and mind, capable of serving as foundations for the new science of nature. 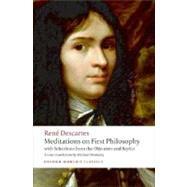 Subsequent philosophy has grappled with Descartes's legacy, questioning many of its conclusions and even his basic approach, but hisarguments set the agenda for many of the greatest philosophical thinkers, and their fascination endures.This new translation includes the Third and Fourth Objections and Replies in full, and a selection from the rest of these exchanges with Descartes's contemporaries that helped to expound his philosophy. Michael Moriarty is Centenary Professor of French Literature and Thought, Queen Mary, University of London.